The Leader-Herald/Kerry Minor Members of the New York State Senate Task Force on Heroin and Opioid Addiction Sen. James Tedisco, Sen. Chris Jacobs, Sen. Frederick Akshar and Sen. George Amedore listen to testimony during a hearing at Fulton Montgomery Community College on Wednesday. First part of a two-day series on the fight against heroin and opioid addiction. GLOVERSVILLE –Kristie Centi’s partner and the father of her son was an organ donor. In a letter to the recipient of the people gifted his organs, Centi described a partner who stayed by her side through surgeries for their son. “Our son was his life and not one day went by when he didn’t hug us, kiss us and tell us how blessed he was to have us,” Centi said. Five months ago, Centi’s rock and Marko’s father, Brad, was rushed to Albany Medical Center after his addiction took over. “He went into cardiac arrest and lost oxygen to his brain for 12 minutes. It was there that I had to make the most difficult decision of my life, to take Brad off life support. He was declared medically dead after 10 days, however he was free of his addiction. 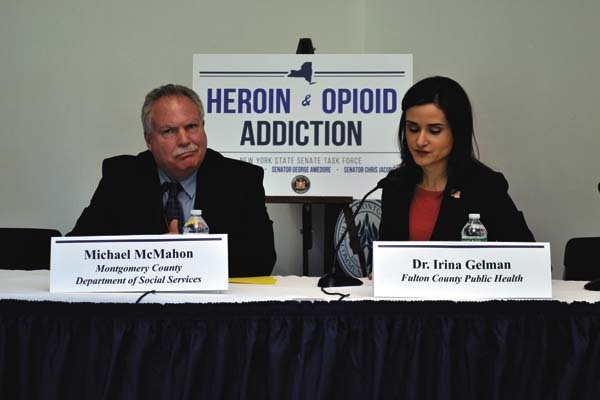 Centi was on hand at Fulton-Montgomery Community College as one of more than a dozen people who told their stories to the New York State Senate Task Force on Heroin and Opioid Addiction on Wednesday. The members of the task force present were Sen. George Amedore, Sen. Fred Akshar, Sen. Chris Jacobs and Sen. James Tedisco. The task force is collecting testimony on the effects of heroin and opioid addiction with the hope of finding a solution to the problem. Task force members are listening to solutions and personal stories from county officials, law enforcement and regular people. Centi testified she learned prior to Brad’s death, he tried to get help, but the clinic he went to was only able to make an appointment for him two weeks out. Those two weeks were too late. It was an addiction that began with pain pills before the couple met. At the beginning of their relationship, Centi suspected something was wrong. Brad was sober for two years during and after Centi’s pregnancy, but when he began using again, he had progressed to heroin. Centi said that she became an expert on detecting when he was using. “His addiction became my addiction. All day, every day, I was so concerned and scared. I sold his car, turned his phone off and followed him when he left the house. I became addicted to his addiction,” Centi said. Amedore said Wednesday’s session was the first in a series of statewide forums taking place this year. He said the purpose of the task force is to develop solutions to the heroin crisis. “To do so, we continue to advocate a four-prong approach. 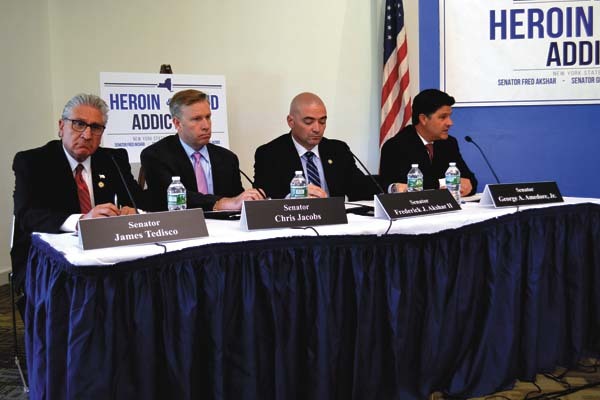 This approach includes: prevention and increasing awareness; ensuring treatment options are available in every community; investing in strong recovery services; and cracking down on drug dealers who are putting this poison out on the streets,” Amedore said. Amedore said the problem is touching every area of New York, including Fulton and Montgomery counties. 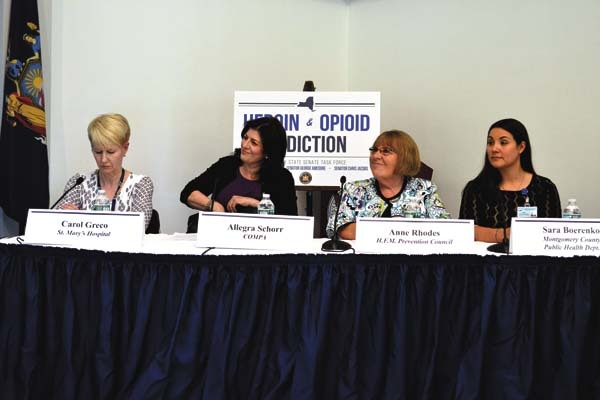 Allegra Schorr of the Coalition of Medication-Assisted Treatment Providers and Advocates said better access to medication would be helpful in fighting this battle. “This is a marathon not a sprint. We really need to think about how we are going to access that outpatient system and how are we going to access those medications,” Schorr said. Ann Rhodes, executive director at HFM Prevention Council, said her agency is focused on stopping addiction before it starts. She said the goal is to work with children as young as kindergarten age and keep working all the way through 12th grade. “Our ask is that you consider prevention as you look to what you want to do in the future to fight this epidemic,” Rhodes. Rhodes said the area also needs emergency housing for those in recovery, telling the story of young woman who lost her battle with addiction in April who could not find shelter. Montgomery County Commissioner of the Department of Social Services Michael McMahon said the epidemic has created issues outside of just the adults. Numbers of children in foster care have been growing in Montgomery County. He said there were roughly 33 cases in foster care in 2013, but more than 80 currently. He said kids are staying in foster care longer, since parents with addiction need to be in recovery before families can be reunited. “Parental addiction is something that is very hard for [kids] to get past,” McMahon said. McMahon said the homeless population needs help as well, since many have an addiction. He said the emergency shelter is full most of the time during the winter. He said they try and get people into shelters such as hotels, but said it can be difficult to do so, since families can often be residing there as well. McMahon said social services often meets with people after family structure has deteriorated, relationships have broken up and jobs have been lost. “We are meeting them in the intersection, in the emergency room we’re sometimes right alongside first responders removing kids because both parents have overdosed,” he said. McMahon said he has seen addiction change communities during his time working as a drug and alcohol counselor in eastern North Carolina during the crack and crystal meth epidemics of the early 1990s. He said he also saw the war on drugs from the front lines as a Marine during deployments to Colombia and Ecuador. Sara Boerenko, director of Montgomery County Public Health, said part of her job is to try and find funds for programs. She said people with substance abuse issues often have mental health issues, and vice versa. She said mental health and addiction agencies should work together since treatment for both is normally needed. “It’s not just about money. 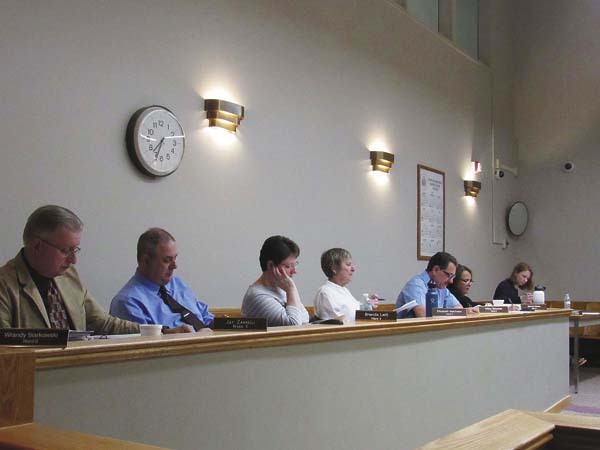 It’s about collaboration and looking at our state agencies,” Boerenko said. Carol Greco, director of addiction services at St. Mary’s Healthcare, said the clinic is enlarging, moving from a 3,500-square-foot clinic to a 17,000-square-foot program, taking over the fourth floor of the Amsterdam Memorial Clinic. Greco said that in the past six weeks, 16 people have been admitted to the methadone clinic. In the past they were admitting three people a month at most. St. Mary’s has hired bilingual-bicultural counselors, added two additional in-patient rehab beds and hired staff to get people in the door quickly. Greco said she has found that the ability to give people the help they need when they walk in the door is critical. Greco said that the one thing these programs need is sustained funding to keep them going. “You can’t just put start-up money and add some money to fuel up on position. 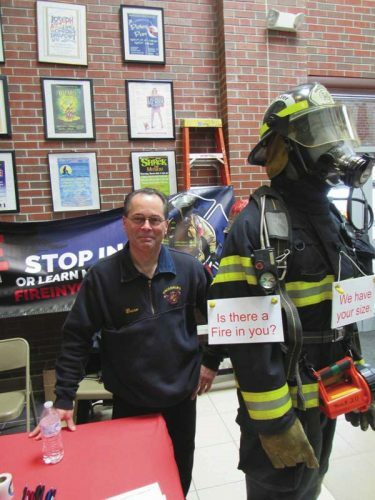 You need to make sure those programs are accountable enough to be sustainable,” Greco said. Coming Friday: Members of law enforcement testify before the task force.